Esmeralda Bermudez was at the park for a family birthday party in late April when it happened. She called out to her daughter, 5, in Spanish. Then a woman, a stranger, approached her, demanding she switch to English. “You’re confusing the poor girl,” the woman told her. In an instant, Bermudez said, she felt an avalanche of emotions: shock, anger, sadness. When she returned to the party, Bermudez stayed quiet. She didn’t want to cause a scene. But later, after speaking to her husband, she tweeted about it. Bermudez’s tweet went viral — more than 77,000 retweets, 400,000 likes and over 2,500 comments within hours. Eventually, she shared her story with the LA Times, where she is a reporter and writes about the lives of Latinos. A lady at the park just scolded me for speaking Spanish to my 5 yr old. You’re confusing the poor girl, she said. No need to worry, I told her. My girl is fully fluent in Spanish, English and Armenian. She’s also learning French. How many languages do you speak? High-profile incidents featuring Latinos being harassed for speaking Spanish in public have seemingly been on the rise over the past few years, leaving many to question whether the hateful incidents have increased in frequency or whether people have become more aware and intolerant of the behavior. According to an AP-NORC poll, about half of all Americans believe race relations in the United States have worsened in the past year. In May 2017, Hector Torres was verbally attacked for speaking Spanish to his mother on the phone at the Reno, Nevada airport. Torres recorded the incident and posted it on social media. A year later, a video of attorney Aaron Schlossberg screaming at workers speaking Spanish to customers in a New York City deli went viral. He threatened to call federal immigration agents, saying they must not be legal residents of the U.S. since they were speaking Spanish. Schlossberg who was mocked in the media, online and at a massive mariachi concert outside his Manhattan apartment, has since apologized. Though some elected officials have tried to solidify English as the national tongue, none have succeeded. The United States does not have an official language. But 31 states do. States including some of those with the largest Spanish-speaking populations, like California and Florida, have adopted English as their official language. According to the U.S. Census Bureau, at least 350 languages are spoken in homes across the country. A record 37.6 million people reported speaking Spanish at home in 2013, according to the Pew Research Center, making it the second most common language in the U.S.
That number has only increased since. Pew Research Center reported in 2015 that 60 percent of Hispanic adults are bilingual. Bermudez said her daughter speaks three languages — Spanish, Armenian, and English. She is also learning to speak French. “She’s just as American as everybody else, the only difference is she’s speaking three to four languages,” Bermudez said. 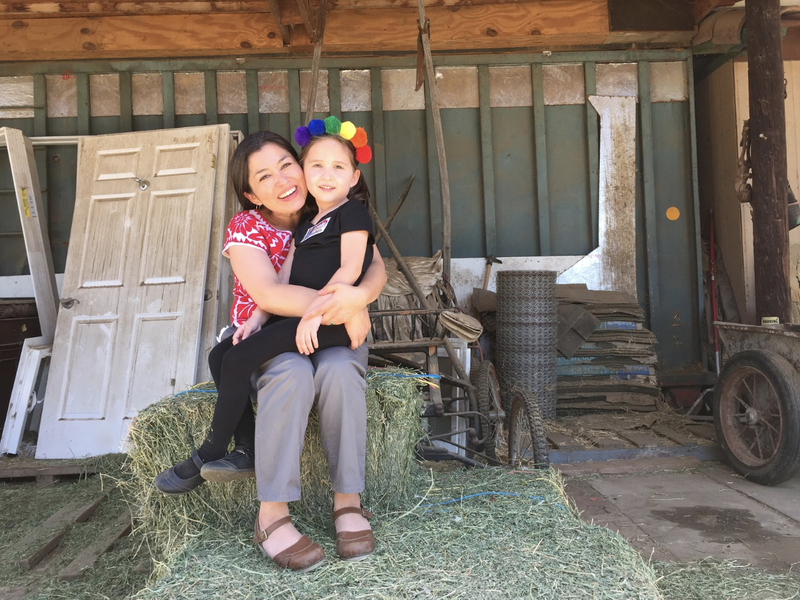 Raising a multilingual child has its challenges, Bermudez said, but she and her husband have worked out a system: Bermudez speaks to her daughter only in Spanish, while her husband speaks to her in Armenian. At school, the little girl learns English. She’s also enrolled in French lessons. Bermudez said her family used to receive a lot of stares for speaking multiple languages. Part of her reasons for sharing her story publicly was to address the curiosity people had. When Bermudez and her family arrived to the United States from El Salvador, she said, it often fell to her to play translator — for job interviews, doctors appointments and more — between her family who could speak only Spanish and others who could speak only English. So when the woman from the park confronted her, Bermudez said, she couldn’t hold it inside. She knew she had to share her story. But she did not expect such an overwhelmingly positive reaction.